Last week was not a good week for some leading members of the opposition National Democratic Congress (NDC) as a number of them were allegedly physically assaulted by their political opponents. It all started on Thursday January 31, 2019 NDC MP for Ningo Prampram Sam George was slapped by masked gunmen believed to be NPP’s vigilante groups. This was closely followed by another fight in the studios of Multimedia station Asempa FM when National Youth Organizer of the ruling NPP, Henry Nana Boakye sent a slap into the face of NDC National Communications Officer, Sammy Gyamfi as reported by MyNewsGh.com. 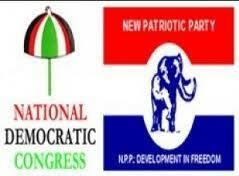 But a former presidential staffer and Member of Parliament (MP) for Builsa South, Dr Clement Apaak has revealed that these pocket of slaps dished out to leaders of his party is a manifestation that indeed change has come, he said in irony, questioning why the Peace Council is not taking notice of these attacks on NDC members. He wrote on his facebook page in a post MyNewsGh.com sighted “Folks, indeed change has come! It’s now acceptable to slap political opponents in radio and TV studios because they have “disrespected the Presidency” and pred to apologise! This is soooo peaceful, so the Peace Council sees nothing wrong with such barbaric conduct! It’s ok to be silent on the shooting and injuring of elven citizens and a sitting MP? Peaceful right!